Peel some of the carrots and the kohlrabi and cut into slices, then into matchsticks. Defrost edamame beans. Clean the sugar peas and cut off the ends, removing the threads that go along the sides, if needed. Toast the sesame seeds until fragrant. 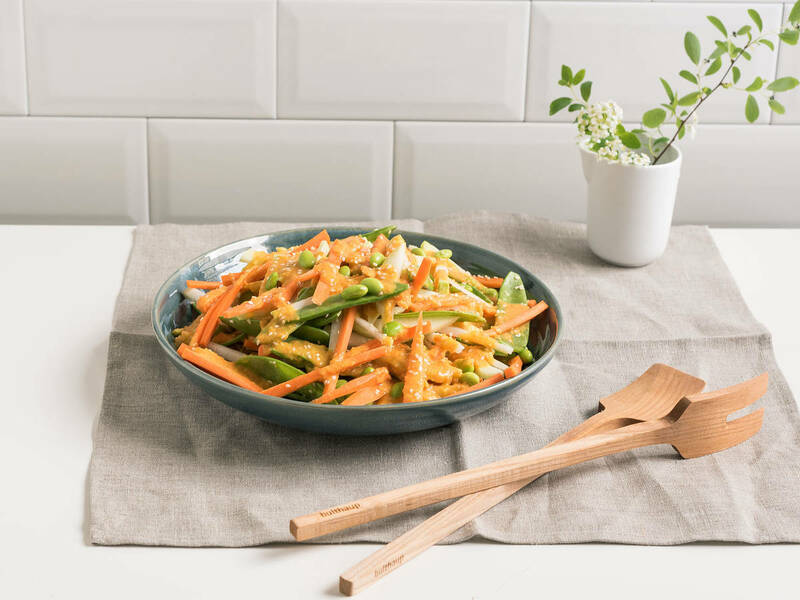 Combine sliced carrots and kohlrabi with edamame beans and sugar peas in a large mixing bowl and set aside. Peel the ginger and remaining carrots for the dressing. Halve or quarter carrots to fit into food processor. Add ginger and carrots to food processor and pulse into coarse pieces until finely chopped. Now add the miso paste, olive oil, vinegar, honey, sesame oil, and some water until the mass is mixed to a thick, thick marinade. If needed, add more water until desired consistency is reached. Add enough dressing to the salad to coat, then top with the toasted sesame seeds. Toss to combine. Enjoy!